Atalanta stunned the Coppa Italia holders Juventus with a comprehensive 3-0 victory at the Atleti Azzurri d’Italia. Juventus had been looking to make it an unprecedented five back-to-back Coppa Italia wins but faced a tough test away to Atalanta. It could be argued that given the other sides in the competition this was perhaps the best draw that the Old Lady could have hoped for. Juventus avoided the more traditionally ‘big’ sides in Roma, Lazio, Fiorentina, Napoli, AC Milan and Inter. Atalanta however, have been simply brilliant at times this season. They currently sit 7th in Serie A and are well within reach of the final Champions League place, only trailing AC Milan by three points. Although Atalanta are a mighty 27 points behind leaders Juventus, the side from Bergamo are the league’s highest scorers with 47 goals in 21 games and have one of Italy’s most in-form strikers in Duván Zapata. The Colombian forward had scored 15 goals in nine games before this Coppa Italia tie, finding in the net in each of those nine games at least once. He also had previous against Juventus, netting a brace in the league fixture just after Christmas in a 2-2 draw. In our tactical analysis we will look at how Zapata and Atlanta were able to continue on their fine run of form against the biggest and best side in the country. Atalanta started in Gian Piero Gasperini’s favoured 3-4-3/3-4-1-2. Juventus tended to operate in a 4-4-2, although their formation at times was more of a 4-3-3 with Bernardeschi pushing forward into a right-wing position and Ronaldo drifting more to the left-hand side. Playing with a back three gives Atalanta a numerical advantage over most sides in this area. When Paulo Dybala dropped deeper to find the ball, Ronaldo was left 1v3 against the Atalanta defence. As such the defenders could be very aggressive and not worry too much about leaving space in behind, since they knew they had the cover and Juventus didn’t have the support up front. 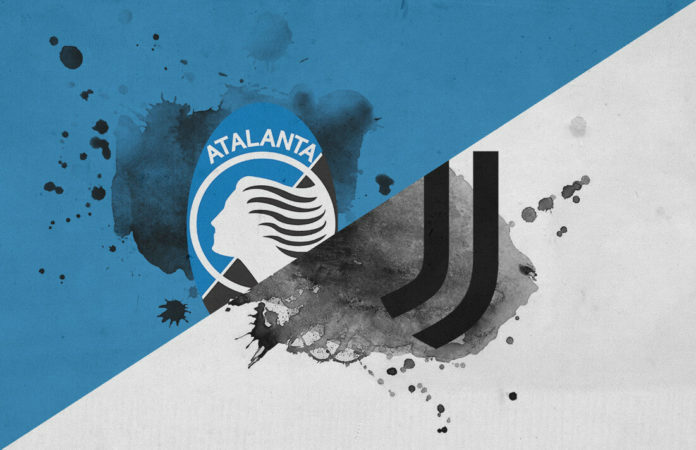 Playing with two strikers supported by the excellent Alejandro Gómez also allowed Atalanta to have some control in the final third, and didn’t leave Zapata too isolated against a famously strong Juventus defence. 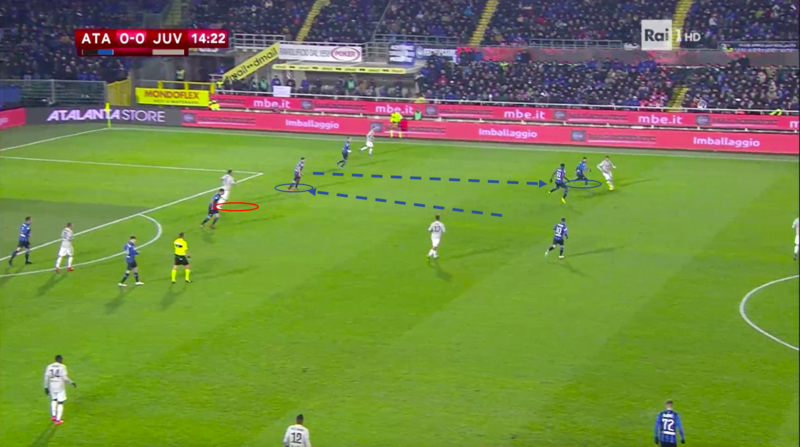 Hans Hateboer and Timothy Castagne provided the width by both operating in advanced positions but also joining the attack slightly late and providing an out-ball for the Atalanta midfield. Both Hateboer and Castagne were also very aggressive and did a very effective job at keeping Juventus’ dangerous wing-backs quiet. As touched on earlier, Alejandro Gómez was tasked with supporting the strikers. He also has more of a free role where he can take up dangerous positions and look to impact on the game for Atalanta, which he did effectively. Following the injury to Iličič midway through the first-half Gómez took up a more advanced role alongside Zapata. As for Juventus, everything looked a little disjointed. Ronaldo was often isolated against Atalanta’s back three as Dybala would drop very deep looking for the ball from Khedira and Bentancur. There was certainly a lack of spark from what seemed a more industrious midfield of Khedira, Bentancur, Bernardeschi and Matuidi. The absence of Miralem Pjanić seems to be affecting Juventus a little as they were second best in this game, and were quite often second best against Lazio in the previous game in the league. Furthermore, Matuidi has been very effective on the left of midfield this past year for Juventus and France, but his threat was totally nullified in this game by Marten de Roon. A prominent feature in Juventus’ narrow win over Lazio was that there was almost a total lack of presence on either of the wings for the Old Lady, and this theme continued against Atalanta. Atalanta coach Gian Piero Gasperini is famed for his side’s ability and willingness to press high and consistently throughout a game. This was no different when the big boys came to town. 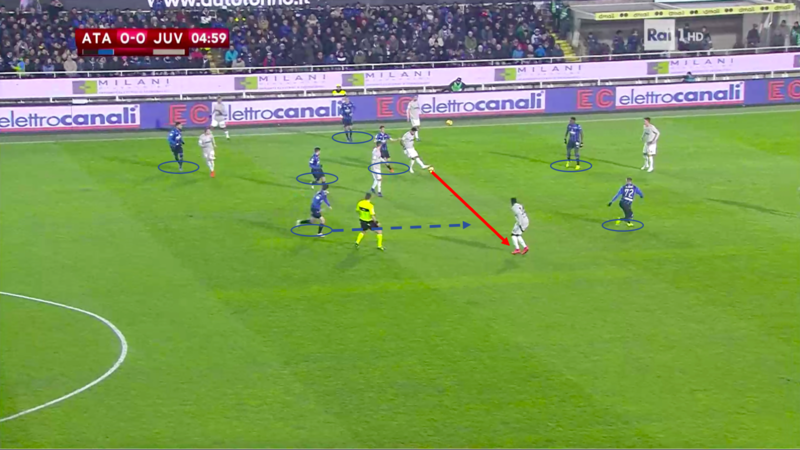 Atalanta operate in a man-oriented press that begins with his front two. The above image is from the 1st minute of the game. 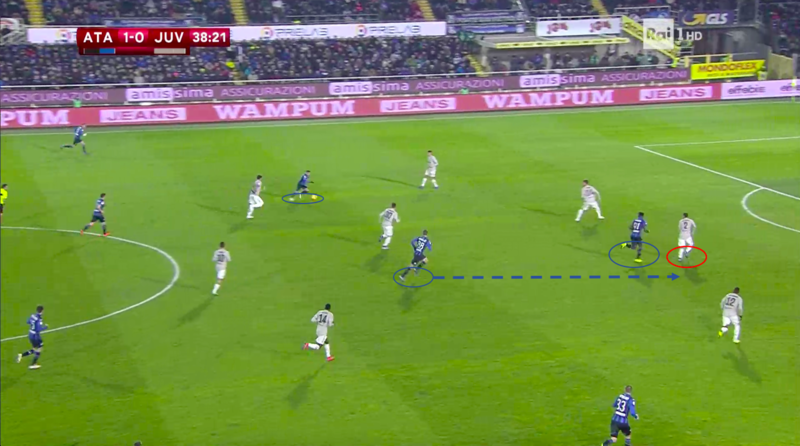 We can see that the Atalanta players (circled) are all pressing their respective men and have forced Alex Sandro into a bad decision as he has no options to pass to. Sandro loses the ball, and Atalanta have an early chance. Again we can see (above) that the Atlanta players are pressing their opposite man. They are forcing the Juventus player in possession into a difficult pass as this is his only option. As Atalanta are somewhat in control of who the player in possession has to pass to, they can read it and react accordingly. This time Iličič gets his foot to the ball and Atalanta regain possession deep into Juventus’ half. Another image taken from early in the game shows Atalanta’s commitment to their aggressive press. The Bergamo side have seven players in what must be at most one eighth of the pitch. Atalanta again force Juventus into a pass which they can easily latch onto and intercept. This time the sideways pass is intercepted by De Roon and Atalanta have another early chance. 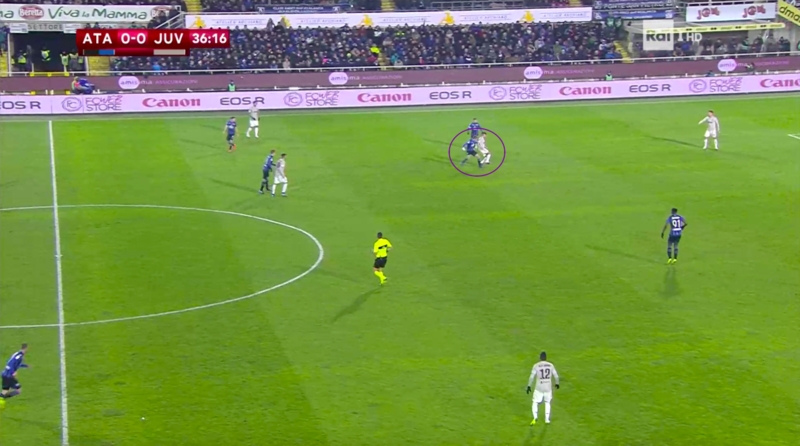 What really stood out were the defensive rotations by the Nerazzurri. 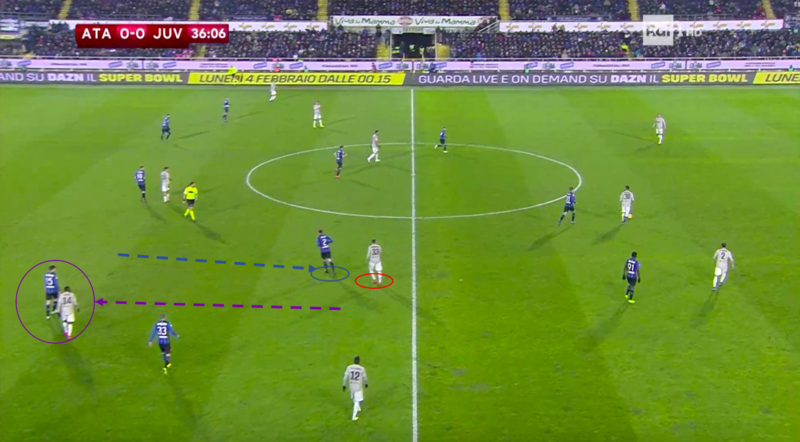 As Atalanta had set up with a back three, at any given time one of the three had the licence to press aggressively into midfield or for example press a forward receiving the ball with his back to goal and then follow him into midfield. This is because of the numerical advantage which I mentioned earlier. At all times Atalanta were able to at least match Juventus’ attacking numbers with their own defensive numbers. As a result of this both Rafael Toloi and Jose Luis Palomino especially were given licence to press their men into advanced positions. To counter for the space left behind, the other two central defenders would shuffle across or tighten up. If a Juventus player attempted to break into the space vacated by the wide centre-back then they would be tracked by either De Roon or Freuler. This was perhaps the most important aspect of Atalanta’s defensive display. It completely nullified the threats of midfield runners into the half-spaces and the areas vacated by Atalanta’s aggressive pressure. Below are some examples of this in action. Above we can see an example of this defensive rotation in action. The left centre-back Palomino has pressured the Juventus ball carrier back into midfield leaving space in the defensive line. Freuler sees this and follows the Juventus runner (red) to prevent any danger. The same scenario takes place above, but this time on the right-hand side with Toloi and De Roon. In the image above both De Roon and Freuler have runners and space that they need to track and both players do so. 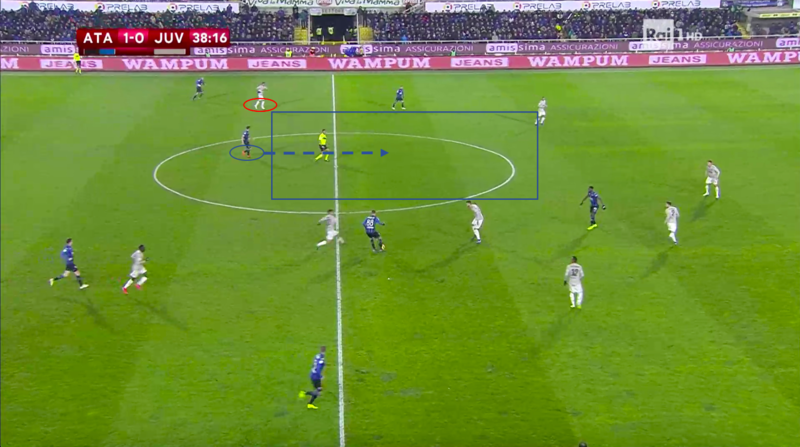 In the image above Atalanta’s defensive system shows that it can be adaptable. The central defender of the three, Djimsiti, is moving into midfield to pressure the Juventus player about to receive the ball. As this is the central defender of the three it is more difficult for Freuler or de Roon to cover the space. Instead, the entire outfield 10 reduces its width and narrows the playing space to negate the hole left in the back three. 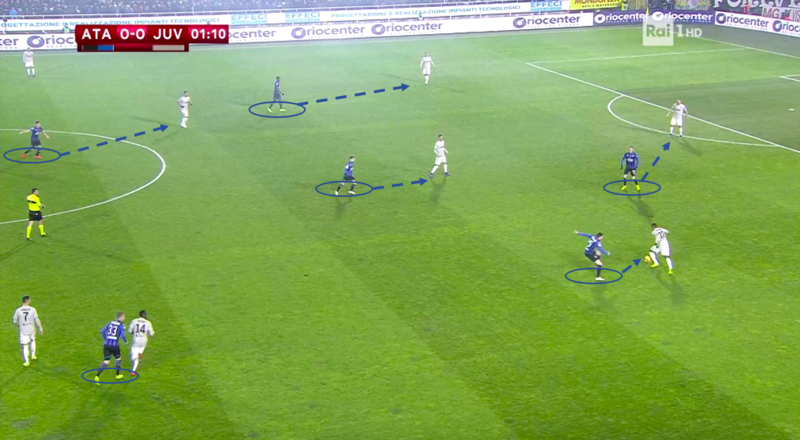 Atalanta’s first goal came about from a very similar scenario to the previous images detailing their pressing game. Atalanta have pressured Juventus into the exact place that they want them. The supporting players have cut off all possible easy out-balls and there is a total lack of midfield presence for Juve. Castagne the left wing-back is harrying Cancelo (red) and forcing him backwards and possibly into a mistake. With the relentless pressure, Cancelo tries to turn away from Castagne but is dispossessed in a dangerous area. Given the fact that Atalanta commit so many men to the press, when they win the ball back they have a 3v2 in their favour. Castagne drives to the edge of the box and the supporting runs of Zapata and Gómez are enough to distract the Juventus defenders and give him enough space and time to finish calmly. The second goal came just two minutes later and was a result of good combination play between the midfield and attack for Atalanta. Toloi looks for a direct ball into the channel for Zapata. Atalanta are looking for Zapata to either secure the first ball and build from him, or for a midfield runner to secure the second ball following a clearance or poor touch. Pašalić latches onto the second ball and can lay a simple ball into the centre of midfield for Freuler who is in a huge amount of space. Somewhat inexplicably ex-Borussia Dortmund midfielder Sami Khedira is positioned wide on the right-hand side and is out of position. Freuler quickly moves the ball into Gómez who is goal-side of the Juventus midfield line. Pašalić and Zapata both cleverly pull onto De Sciglio who is now playing in a less favoured role as a centre-back in a back four. The Juventus defender has two men to deal with as Gómez plays the ball into his area. Zapata manages to control the ball and fire home. Atalanta’s third and final goal was a terrible mistake by a Juventus defender from a long goal-kick by Berisha. Atalanta fully deserved the victory here and the scoreline is not an exaggeration of their impressive display. They completely blunted Juventus’ attack and caused them all sorts of problems going forward. Gasperini’s side are always exciting to watch and unfortunately often fall foul of results that their performance doesn’t warrant but this was not the case at all in this outing. It would be incredibly refreshing to see Atalanta go on and achieve great things this season, whether that be a Coppa Italia win or qualification for the Champions League. As for Juventus, they looked languid and lacking in ideas. The XI that played lack invention and a little bit of creativity and it certainly showed. Although Juventus will probably have bigger fish to fry when it comes to retaining the Scudetto and possibly finally securing a Champions League win, they will be bitterly disappointed to have been beaten so comprehensively in a tournament they have been so successful in recently.